Overall I really liked this one. It seemed like a fresh twist on the vampire story, but not enough that they’re reinventing the whole thing. I mean, some things have to stay the same. You don’t have to make the vampires sparkle to see them from a different point of view. Now, it lost a star because of the prose. I can’t put my finger on it, but there was something so unlikable about the writing right from the start. And then the story drew me in and I didn’t care about that anymore. The structure is odd. You get present day Tana, and then we get an infodump about the coldtowns or she tells us something about her past, and then back to present day Tana in the next chapter. The stuff we were told was interesting, but I couldn’t help but feel there might have been a better way to put it across. Tana was an interesting character, not very likable, but interesting. She had a lot more flaws than I usually see in protags. I liked that, but I didn’t like her. Didn’t hate her either. My favourite character was our mysterious guy. He’s wonderfully broken, and really quite mad. In fact I was a little disappointed he wasn’t more mad. In my mind it pushed credibility that he had so many sane moments, and then swung to mad again. The other characters were OK, but I don’t feel the book delved deep enough into any of them to develop more than a general feeling of like or dislike. Now the setting WAS something to write home about. The descriptions of the coldtown are pretty awesome, and the world building was pretty unique. I think it was best summed up by Tana’s little sister who has a pictures on her locker of one of the most famous vampire hunters next to one of the medias most glamorous vampires. Vampires are hated, and they’re worshiped. The plot wasn’t bad either, a little slow to start, but a part of me liked that. It meant time to drink in the cool world Holly Black built, and the terror Tana feels. Once Tana gets into coldtown things speed up, and I started to like the character more, because she started to do stuff. And there’s a twist. I won’t tell you what it is (but you might guess it before you get to it – I did), but it was pretty damn awesome. I found myself grinning from ear to ear at that part, and I’d guessed what was going to happen for a while. Most of all I loved the books look into madness. Mysterious guy’s madness, and Tana’s madness (because by the end she’s pretty damn cuckoo). ‘Cause they don’t dwell on it. They stand up, broken and bleeding, and carry on doing whatever they’ve got to do. Tana’s internal pov had some angst, but particularly as we neared the end it was more ‘wow I’m messed up, now shelve that, how do I save my friends?’ And less woe is me. This is a book I firmly believe everyone should read at least once. The author was very devoted to making this as truthful as possible. He interviewed many many people involved, and I got the idea reading it that their stories really affected him. There’s just so much feeling in this book: bad feelings, and good ones too. Dates. Numbers. Stereotypes. None of it meant anything because no one cared whether we forgot real people were killed, all they wanted were the dates and numbers. There’s a moment near the end when a few Jewish people are being transported in a normal passenger train by SS soldiers. A German citizen stands up, and glaring at the soldier gives one of the Jewish children some food. There were many small moments of defiance like this through the book and when you weigh it against the overwhelming risk and disapproval of being a ‘Jew lover’ I found them all so amazing. Because you’ve got to remember at the start a lot more German citizens did what everyone says they’d do now. They went against everyone (police, government, employers, family, friends) and spoke out against what was going on. What happened to those outspoken people? They were labelled ‘Jew lover’ and those that weren’t killed or imprisioned were shunned by society. I’m truthful enough to say that I wouldn’t know what I’d do if that happened in my country. I’d have been raised to believe it was right for a start, and even if I managed to escape the mass brainwashing happening everywhere (not just Germany. America was the first country to sterile someone deemed to have inferior genes) I’d be considered inferior myself. I’m not Jewish, but I am disabled, and so many disabled met their ends in those gas chambers. I’ve gone on a tangent. Back to the book. I’ve read things on world war two before (it’s a favourite topic of mine), but nothing has quite put across the sheer number of dead like this one. The book contained multiple povs (all actual people interviewed by the author), and each one saw so much death. There’s horror after horror, meaningless murder after murder. We lose men, women, children, individually and in groups of hundreds at a time. Some we get to know, others we catch only glimpses of. Don’t let this put you off. All through the book are moments of humanity that show bright through the horror. Schindler listens to the radio one night with a Jewish friend. He’s estatic. There’s been an attempt on Hitler’s life, and he believes the man is dead and the war is lost. And then Hitler comes on the radio and assures people he’s alive and the war will go on. Schindler (the German) is so distraught that his friend (the Jew) has to comfort him. And then Schindler said something that stuck with me. He said ‘we will have to wait for our freedom’. Not ‘you,’ ‘we’. That’s another thing the book shows so well. Unlike what my school told me, it wasn’t ‘Evil Germans’ against ‘Poor Jews’. So many people, including Germans were trapped by what was going on. There’s something almost casually mentioned near the start of the book. One of the reasons why the gas chambers were made was because of the high suicide rate in soldiers who were forced to kill Jews. It got so bad that Hitler made several tactics, including different training and the gas chambers to fight against it. One of the things I loved about this book was it showed so well what my school education didn’t. There are no black and whites here. Sure, there were horrible people who did horrible things, but there were also victims of all races, creeds, and even uniforms. Just go read it. It’s one of those life changing books. I promise you won’t regret it. Maybe you’ve heard of this one. 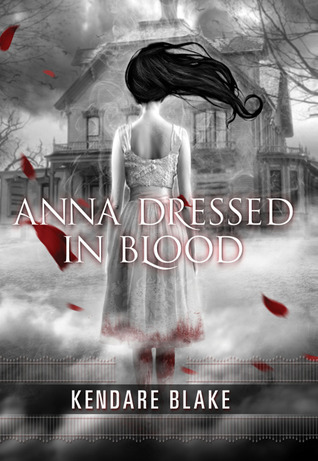 It’s got a creepy looking cover with a girl in a blood soaked dress. Cool looking huh? Now there is some gore in it, but overall I’d say this isn’t that much of a scary book. You might disagree. Remember I’ve read a lot of stephen king, so your definition of creepy may differ from mine. Now, the book does have a couple issues. There is a vibe of insta love going on. And our Cas/Dean protag does spend a large amount of the book dealing with teenage problems. The whole ‘I don’t need friends, I’m a badass ghost hunter’ kind of thing. And I felt some of the adults – particually grandpa Morfran – were less fleshed out. It was a little like those kid shows, where the adults drift in when they’re needed and then conviently disapear into the background. Saying that, I think the mother was done well. She knew her son had to do this, that if she didn’t help he would sneak off and kill ghosts anyway. She helped where she could, and worried when she couldn’t. I’ve read a couple reviews that shun her for not grounding him, but I think she did what she could. She didn’t want to lose her son. I can understand that. Now my favourite character of all was Thomas. Think Xander from the television show buffy when he was all shy. (There’s also a Giles like character who helps with research.) Thomas was just so darn cute. All plucky and determined, and then a girl walks up and he’s blushing and falling over himself. The plot wasn’t bad. There’s a decent amount of action here. One big twist near the end, but not much in the way of twistiness before that. For me it was like watching a television show (more like Buffy than supernatural). The plot was good, but not brilliant, but that didn’t matter because it was the characters that made me stick around. There were some hefty loose threads by the end, but there is a sequal that might explain those. I’ve read 53 books so far in 2013. Some good, some not so good. I’d be hard pressed to choose a favourite, but if it came down to it, I think ‘Angelfall’ by Susan Ee would be the one. After reading that I wasn’t sure. I mean, on the face of it: warrior angels, that’s cool right? And I do love a good apocalypse. But then the doubts set in. Teenage girl protag, and a possibly angst ridden supernatural entity who is obviously meant to be a love interest. What if this girl ‘Penryn’ spends the whole book fawning over the mysterious guy with superpowers? What if he sparkles? Well folks, I read it and am pleased to report that the nearest he comes to sparkling is when he’s covered in blood. Phew. This is a badass angel, and best of all he actually does stuff! No moping in a corner the whole book going ‘woe is me.’ Sure the angst is there, but it’s more of a ‘I’m gonna get my own back and kick their asses’ kind of vibe. I can deal with that. And I loved Penryn! She wasn’t this passive thing waiting for a big strong man to save her. The whole book her focus is on her sister, like an actual human being. No fawning. The only reason she sticks with Raffe is to get her sister back. She hates him and is terrified of him in equal measure. Yet she fights all this to use him to get her sister. Any feelings between them are always secondary. Now lets talk for a minute about the book outside the relationship between these two (which by the way I think is the most realistic relationship between a human and supernatural entity that can kill them at any moment I’ve read). This is a dark book. People die. Things happen that some might consider worse than death. It’s about an apocalypse, and it reads like one. There were moments I felt like crying when I turned the page to find another horror that happened. And as the book went on the horror and the mystery got even worse, until the final reveal (which I won’t reveal except to tell you my stomach rolled and my heart flipped over). I could talk about what I liked about this book for ages. It’s just so darn good. But what I loved the very most was that the people acted like people. Penryn was the determined protective sister (which when you read her back story makes so much sense). Some people gave in, some despaired, others fought. Everyone was just so flawed and human.